However, this year the event has moved to the beautiful Lainston House, so it’s a new course. I didn’t really think about this too much in advance, which was my first failure. Anyway, I reviewed my packing list earlier this week and updated it based on the weather conditions and my current kit. Then I spent Saturday afternoon organising my kit and packing it carefully into my transition bag. usually, I try to minimise the decisions that I can make on the day, but the weather was forecast to be overcast with a maximum temperature of 6°C (43°F), with the windchill making it feel like 1°C (34°F), so I packed a few items of clothing that I would be able to put on in transition. 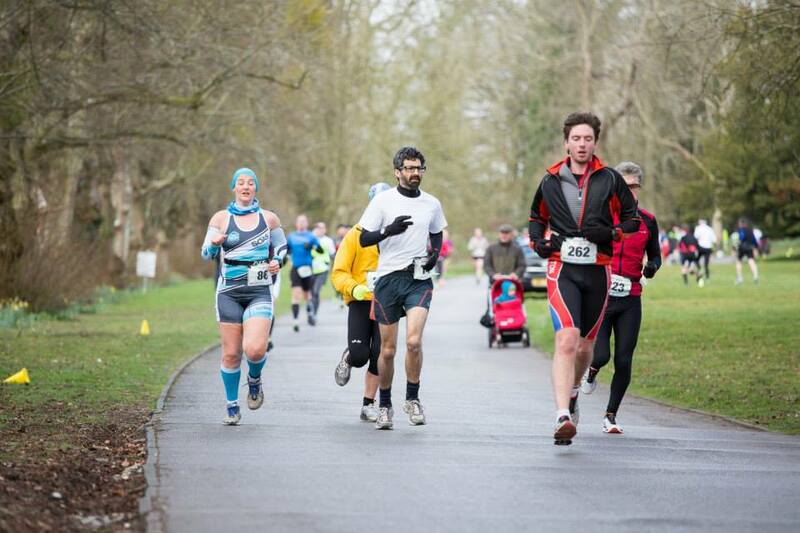 This is where I find duathlons difficult – I am happy to run in just a vest and shorts in cold weather as I know that I will heat up quickly and if I wear base layers or gloves I will overheat. However, I can get cold very quickly on a bike, so I didn’t want to just wear my tri tank and shorts. 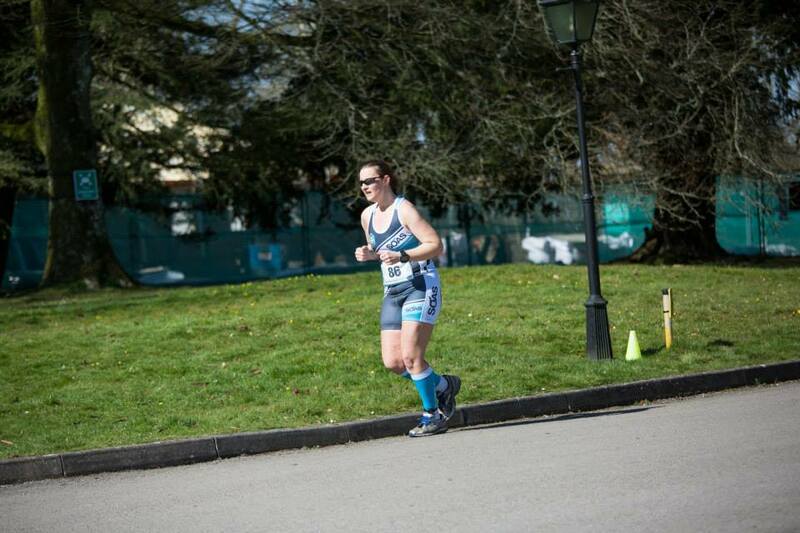 I decided to start the race with calf guards on to help keep my legs a bit warmer. The standard race was scheduled to start at 8am with race registration between 6am and 7:30am. For most Try Tri events, registration is also offered on a Saturday afternoon, which gives competitors the chance to see the run course, transition and possibly drive the bike course, however that was not on offer today (which I think was a shame). Stuart and I decided to get up at 5:45 this morning, as we only needed to eat breakfast, dress and put our kit in the car. Fortunately, Ben from Try Tri was nearby, so I spoke to him and asked whether I could register both of us whilst Stu rushed back to Southampton (about 16 to 20 miles away). Ben agreed, so I put on Stu’s rucksack and started heading to the race registration. I am so grateful that I’ve practised running whilst holding my bike’s saddle and that Stu’s bike is very light, otherwise I might not have made it to registration. When I got to the front of the queue, Ant (my coach from Run Camp) was registering people, so he was happy to sign me in and give me the Team Smith numbers, timing chips and stickers. I quickly collected our bikes and started walking down the hill to transition. When I got there, I saw Coach Peter from Southampton Tri Club. he wished me well. Then I went over and spoke to the two ladies who were controlling entry to transition. It is standard for competitors to have to demonstrate that they have an appropriate helmet and that they have working brakes. Unfortunately, I only had Stu’s helmet (which would have to be adjusted a lot to make it fit me). A quick phone call to Chris got me access to transition. I am so grateful to these guys as otherwise my race would have been over before it even started. I racked our bikes and then started going through Stu’s bag to try to get as much as possible ready for him. I set up his shoes and put his number on his race belt. I also got out his bike helmet. Then I removed my track suit trousers and cycling jacket, but I decided to keep my SOAS hoodie on a little longer as it was far to cold to strip off to a tri tank at that point. I then checked my phone – a missed call from Stu. he had been trying to tell me that he would be driving past transition, but I was too late and he was in the car park at the top of the site. I have never been so grateful that an event has been running late. As Stuart appeared, the marshals were ushering people out of transition. I quickly got my bike shoes out and put on my race belt. I removed my hoodie and decided that I would try running with arm warmers on, figuring that I could push them down to my wrists if I got too hot. I got my helmet out and decided to put my headband on. As it still felt cold, I left my cycling jacket by my bike. I was a bit thirsty and needed the loo, but there was no time for either of those as we had been told to line up by the start gantry. I lined up behind Stuart and a couple of guys from SUTRI (Shriram and Peter)… then we were told to turn around. Ooops – I was far too close to the front and didn’t want to hamper anyone else’s race. I then looked up at the view and realised that we were going to have to run up a big hill. I was still feeling optimistic and decided that we must have to run up the hill and then we would do four loops around the house before running back down to the bikes. I tried to set off at a steady pace, but it was tough from the start. 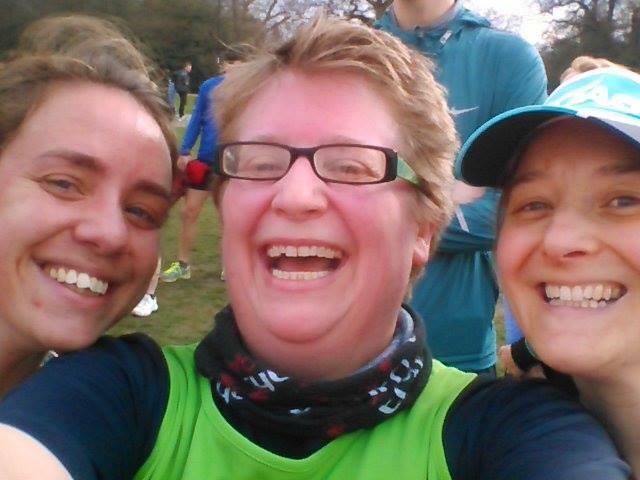 I also realised within 100m of starting that I still had my buff on, but it was too late to do anything about it. The sprint and novice events started just after the standard, so I was being passed by lots of faster runners. At the turnaround point, Jonathan cheered for me and then I started heading back up the hill. Urrghh! My legs always feel far stronger than my lungs (which I always assumed was a sign of how unfit I am – apparently, it’s more likely to be related to my asthma) but even my legs were feeling the hill. When I got out onto the field, I had a good look around and identified a suitable hedge for a ‘comfort break’. This is something that I would NEVER have done before I did cross-country running, but I thought that it might help me to get my head back in the game. I felt better when I headed off, and tried not to think about the fact that I still had 2.5 laps to do. The guys from SUTRI were looking very strong. Peter was totally focussed every time he blasted past me. On my third ascent of the hill, I saw and heard Stuart and Shriram. I shouted to them that if they were chatting they weren’t trying hard enough and then carried on. Finally, I was on my last lap. Before I saw the course, I had been wondering how close to my 10k PB I could get (51:06), and even at the start line, I discussed with Sergio that I thought I might be able to do 55 minutes. On my way down the hill, my only aim was to go as fast as I could to try to get under 1 hour! As I headed into transition, I knew I had to put on some more clothes. I was surprised that the sun had come out, so I rummaged in my bag to find my sunglasses. Usually, I am much better organised, so this lost me some time. After putting on my helmet, bike shoes, gloves and jacket, I headed out to transition. There wasn’t a clearly marked mount line, but we were told to head to the road and mount there. The route was much flatter for some time after the first hill and I was quite pleased with my pace, which was averaging over 28kph. I felt really happy as I had no idea what the second half of the course was like. I decided to try to take on some nutrition, but my honey stinger waffle was firmly stuck in its packet, so I licked the end of it and put it back into my bento box, praying that 1g of carb/sugar would give me enough energy to finish the race. About half way, the route turned left and then became extremely hilly. About 4km from the end of the lap, I saw another cyclist ahead and could see I was making progress, which spurred me on. I pushed hard to the end of the lap and felt quite confident that I could achieve an acceptable time. Half way around, I saw Shriram with his bicycle by the side of the road. I asked if he was Ok, but didn’t quite hear the answer, so I offered him an inner-tube. (Later he confirmed that he had broken his rear mech hanger). This wasn’t any help, so i confirmed that I would let the next marshal know he had a problem. At this pont, the girl I had passed seized the opportunity to pass me. I was unable to catch her again and a few kilometres further on, I was passed by another woman. I managed a reasonable flying dismount and then had to start running, which felt odd as my toes were very cold. I was surprised by how far the run was from the mount/dismount to the transition area. I was hoping that I wasn’t picking up too much debris on my socks. 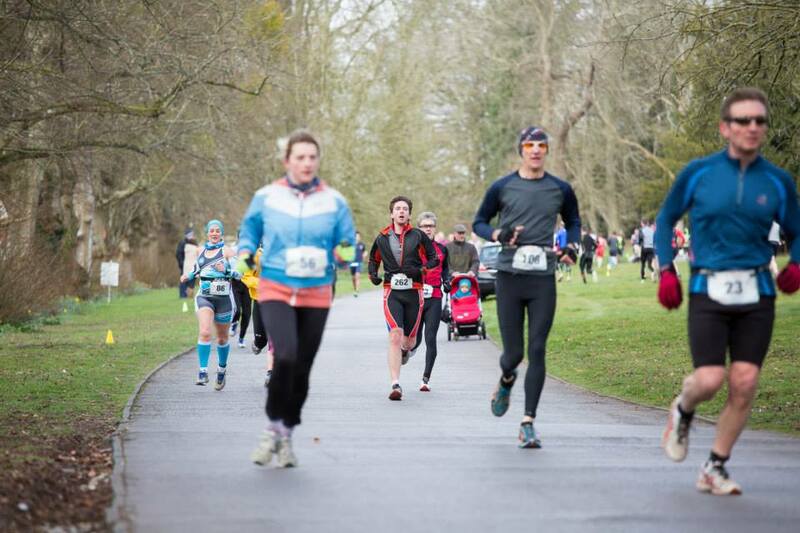 I was also a bit disoriented and nearly ran through the finish funnel, rather than into transition! I brushed my socks off, slipped my trainers on, removed my helmet, jacket, buff and arm warmers and started running. When I checked my splits later, I was pleased to see that T2 continues to be my best discipline. Even if I’m terrible at everything else, Graeme has made me good at this aspect! It was quite a relief to see that there were still runners on the course, even if they were finishing their second lap. This run felt tough. By the time I was nearing the top of the first hill, I was wheezing, so I got my inhaler out and had a couple of puffs. I was passed by a chap who asked me whether I was on my last lap. I misheard what he said and replied ‘yes’. By the time I had properly processed this, the runner had gone. I was glad when I started descending. I could hear the cheers from SUTRI and ‘bike gang’ (Liz, Katherine, Stuart and Jenny). I passed Jonathan at the bottom turnaround and then started heading back up the hill. When I had passed the supporters, I decided that I needed a walking break. However, I mistimed it and Coach Peter saw me walking. he shouted out that he thought I was better than that, which made me feel really guilty, so I started running again. By now, most people had finished, so I had to dodge lots of people taking their equipment back to their cars, which was a little frustrating. By the time I got to the flatter area on the field, I felt really rough. The only person who I was aware of being behind me, caught up with me and then passed me. I tried to keep up, but my calves were cramping and I had no energy left. I was passed a bottle of water and a medal and I was done. I congratulated the lady who had passed me on her run and had a chat with her and her friends about my awesome kit as they had commented that they liked it when I was running. I was 3rd in my age category (podium!) and 10th out of 12 female finishers. I think the results may change and that some athletes may be disqualified as there are some pretty amazing 5k times there. Today I felt like I earned my medal. 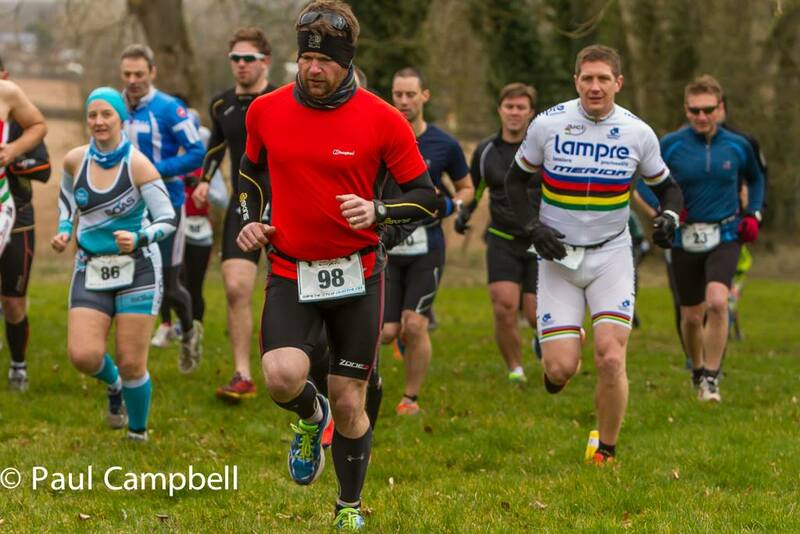 Overall, I think Winchester Duathlon was the most brutal event I have ever done. 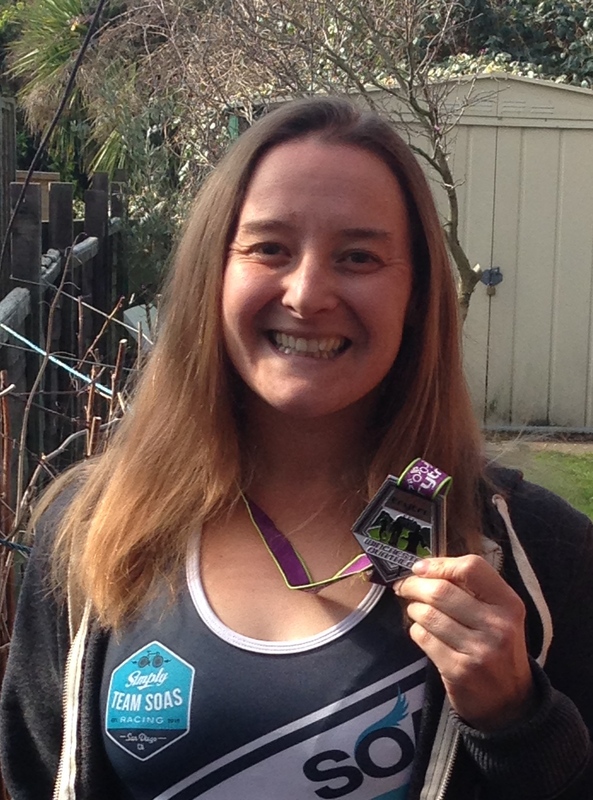 I did the Dorset Endurance Life Coastal Half Marathon back in December 2012 – it was over 16 miles of going up and down the cliffs around Durdle Door/Lulworth Cove in Dorset, however, I was prepared for that. I enjoyed doing my first race with friends from SUTRI, most of whom achieving awesome results including winning the sprint and standard races – it’s fab to have loads of people cheering you on during a tough race. It was also great to give my new Team SOAS 2015 kit its first airing. I know everyone says that you should never try anything new on race day, but I’ve never had a problem with any of my SOAS kit, so I had complete faith it would be just as awesome today.